We are rounding the shops once again to go on a lookout for a baby pram and this time, we are featuring a buggy without the bug down heavy. Ideal for young parents and those who don’t want to tug along, or push, pounds of load, the Graco Metrolite Travel System is well worth the look. The word to watch out for in this line by Grace is Metrolite. It is one of the lightest above industry standard strollers, a full size travel system loaded with your favorite stroller good stuff and features without the accompanying bulk and weight. It weighs almost half less than your regular top of the line baby buggy! Get ready for super-easy baby rolling! What is in this super lite Graco model that makes it so? The Metrolite is made and designed with navigating ease and convenience in mind with focus on weight and bulk eradication. The secret is its aluminum frame that is lightweight but very solid and durable. SnugRide car seat with a 5 point front-adjust harness offers maximum comfort and protection for your baby, also easy adjusting of the harness by mommy. Lock front shocks and swivels at one button push every time you want smooth straight steering. Height adjustable handle to match your most comfortable strolling. One-hand folding mechanism, extra large drop-down basket, parent’s tray and child’s tray. Car eat has Energy Absorbing Foam Liner for extra comfort for baby, and two removable newborn head supports. 40 lb baby weight limit, easy to read level indicator. The stroller has a 40 lb baby weight limit and it has an easy to read level indicator. You can also convert the 5-point harness to a 3-point for toddlers. A popular hit feature is the EPS or Energy Absorbing Foam Liner in the car seat that provides much added comfort for baby by absorbing impacts allowing baby to sleep blissfully without being disturbed. 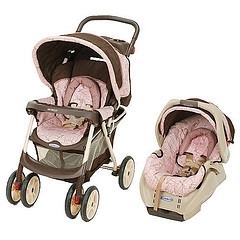 The travel system also comes with two removable newborn head supports. While most strollers feature easy and secure car seat to stroller integration, the Metrolite stroller goes the extra mile by having extra clips on the back bars to hold the car seat for added security. Another safety feature is its easy to engage foot brake. However, you need to skip on the open toe footwear since disengaging involves putting your foot under the brake and pushing up, which can be a little painful when done carelessly. The stroller’s folding mechanism motion that is a combination of a button push and squeeze in the parent tray area also needs to be properly figured out for it to be truly easy. The Graco Metrolite Travel System is designed for smooth to mid-rough terrains and is by no means to be considered an all-terrain stroller. However, for neighborhood trips on smooth surfaces, sidewalks and store walks, and any urban or suburban setting minus the offroads, you will find that this is all you need. Lightweight, not bulky, convenient, easy to maneuver, and most of all, reasonably priced, this stroller is the perfect companion for casual day outs with your kid. For more feedback on the Graco Metrolite Travel System, tips and other baby stroller option, drop by in one of the web’s best guides to baby strollers and a host of other neat baby stuff.